Oh my gosh what a gorgeous place! We got out of the (insert swear word) bus to kiss the blarney stone. 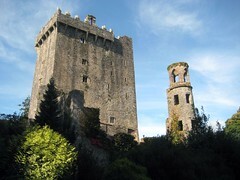 Frankly, I had no idea that Blarney Castle is on many many acres of gorgeous park, and the castle itself is fabulous. I could have spend a day here. I also was reminded that I LOVE castles! Note to self: next trip to Ireland: CASTLES!